Back cover blurb: A pacy, chilling psychological thriller, set to reinvent the genre. It begins, they say, with a woman screaming… On a remote Scottish island, the McBride house stands guard over its secrets. A century ago, a young widow and her son died mysteriously there; just last year a local boy, visiting for a dare, disappeared without a trace. For Zoe Adams, newly arrived from America, the house offers a refuge from her failing marriage. But her peaceful retreat is disrupted by strange and disturbing events: night-time intrusions; unknown voices; a constant sense of being watched. The locals want her to believe that these incidents are echoes of the McBrides' dark past. Zoe is convinced the danger is closer at hand, and all-too-real – but can she uncover the truth before she is silenced? The owners of the house are also the landlords of the local pub, Zoe is taken there on her first night on the Island to meet the islanders acquaintance. Some of them are more welcoming to Zoe (and newcomers in general) than others. Edward, the local teacher, and Charles the local bookshop owner befriend Zoe almost immediately. Edward is decades younger than Zoe, but there is something undeniably attractive about him which Zoe fights hard to resist. She didn’t come away to find a new partner, and she certainly doesn’t need further complications in her life. Both are aware of the history of the McBride house where Zoe has chosen to stay, and both are concerned for her wellbeing, whilst telling her not to listen to local folk scaremongering. Zoe as you can imagine, is confused by the mixed messages she’s receiving. She decides to just ignore the tales of the house’s history and enjoy her time in a house so very different to her own. While You Sleep opens with two young boys taking part in a dare outside the McBride house, which is supposedly haunted. One of them loses their nerves and makes a run for it, whilst the other stays and is never seen again. The locals are clearly still in shock, even though more than a year has passed since the boy disappeared and Zoe arrived, the two things shouldn’t be connected, but Zoe is soon to find out that everyone on this remote island is connected somehow, whether they want to be or not. 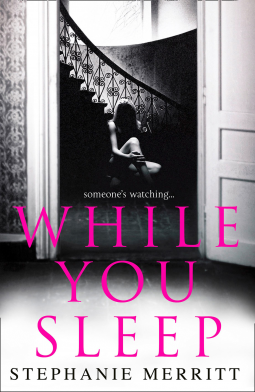 While You Sleep is a creepy, atmospheric thriller and something very different to my usual read. I loved it! While You Sleep is available from 8 March 2018.